The Populist Challenge: Trump Brexit & Co.
World politics is in turmoil. After the Brexit vote, US elections are behind the corner. Professor Pippa Norris from Harvard Kennedy School will present to us her last work on "Trump, Brexit, and the Rise of Populism: Economic Have-Nots and Cultural Backlash", written with Ronald F. Inglehart, Professor at Michigan University. 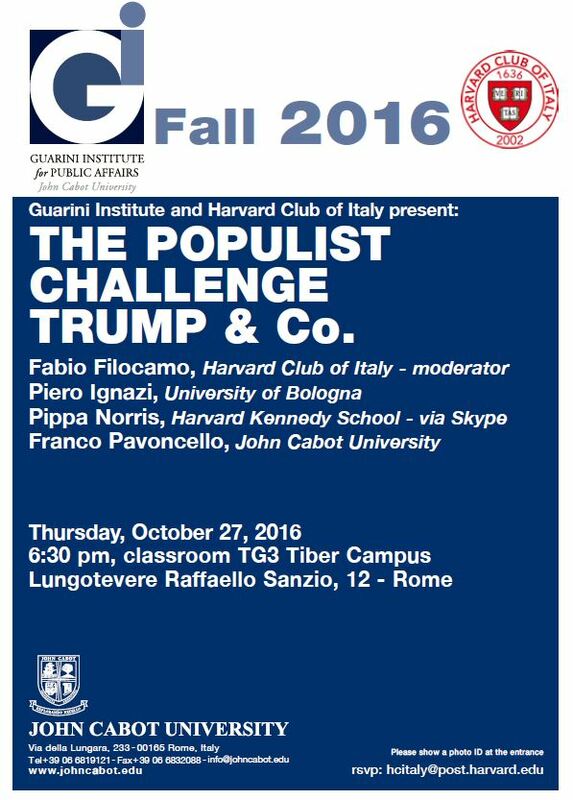 A discussion will follow, held by Piero Ignazi, University of Bologna, and Franco Pavoncello, John Cabot University. Pippa Norris is the McGuire Lecturer in Comparative Politics at the John F. Kennedy School of Government, Harvard University, ARC Laureate Fellow and Professor of Government and International Relations at the University of Sidney, and Director of the Electoral Integrity Project. Piero Ignazi is a Professor of Comparative Political Science at the University of Bologna. Formerly, he has served as Dean of the International Relations School at the same University (2000-2003) and as Director of "Il Mulino", a political sciences review (2009-2011), Fulbright Scholar and MIT Fellow. Franco Pavoncello is a Professor of Poliical Science (since 1990) and the President of John Cabot University in Rome (since 2006). Previously, he also served as the Dean of Academic Affairs at the same University (from 1996 to 2005), a Ph.D. from the University of Michigan. What: The Populist Challenge: Trump, Brexit & Co.